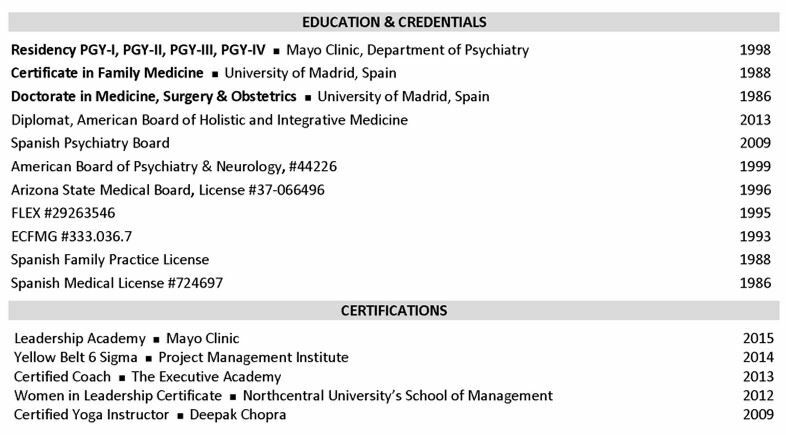 The traditional curriculum vitae (CV) used for medical and academia careers has evolved over the last few years to go beyond a list and communicate the value a candidate brings to an organization. This month’s resume expert, Kris McGuigan, demonstrates how adding a few modern elements can make a big difference on the impact of your CV. Modern CVs include a summary that highlights the most important qualifications or accomplishments. Target specific organizations or roles by speaking quickly to what decision makers will deem important – clinical skills, teaching experience, or leadership successes. Like any other modern summary, keep it short and specific. Perhaps the most substantial change in CVs is the transition from a list of details to stories with context and demonstrated value. Speak to value that is relevant for the target position, add in scope when appropriate, and quantify results whenever possible. Keep your stories succinct, use white space to help a reader skim through them quickly, and use formatting – here headings and sub-bullets – to break up long lists. CVs will still include the lists of educational credentials, clinical skills or equipment, certifications, publications, presentations, and more. Use formatting to make these lists easy to skim and modern in appearance. As you determine what details to include, know what is appropriate for the level of position and audience. Consider the relevance and potential negative impacts of including older presentations, publications, and other information. View the complete sample here. By clicking below, you agree to never copy content or design of a resume … that goes against everything that makes a resume successful! Looking for help with your resume? Learn more about Kris McGuigan and other ACRW graduates.